1. Arches National Park (1971) - contains the greatest density (> 2000) of natural arches on Planet Earth, including the longest natural arch in the world, Landscape Arch at 290 ft. Towering sandstone spires, fins and balanced rocks are also found throughout this park located in the central portion of the Colorado Plateau. 2. Bryce Canyon National Park (1928) - horseshoe-shaped limestone amphitheaters carved from the erosional force of frost-wedging and rainwater that have formed bizarre shapes including slot canyons, windows, fins, and spires called "hoodoos" along the eastern edge of the Paunsaugunt Plateau (the upper section of the Grand Staircase). 3. Canyonlands National Park (1964) - preserves a colorful sedimentary rock landscape eroded into countless canyons, mesas and buttes by the Colorado River and its tributaries. The park is divided into four districts: the Island in the Sky, the Needles, the Maze and the rivers themselves (Colorado and Green). 4. Capitol Reef National Park (1971) - defined by a nearly 100-mile long warp in the Earth's crust, the Waterpocket Fold (a monocline, or "step-up" in the rock layers, with one very steep side in an area of otherwise nearly horizontal layers). The rock layers on the west side of the fold have been lifted > 7000 ft. higher than the layers on the east. The Waterpocket Fold gets it name from the numerous small potholes or "pockets" found in the area that can hold rainwater. 5. Zion National Park (1919) - the oldest National Park in the state. Characterized by high plateaus, a maze of narrow, deep sandstone canyons, rock towers and mesas, and the Virgin River. Kolob Arch, 2nd longest (287 ft.) natural arch in the world is located here. 6. Grand Staircase Escalante National Monument (1996) - a geological formation spanning eons of time and is a territory of multicolored cliffs, plateaus, mesas, buttes, pinnacles, and canyons. 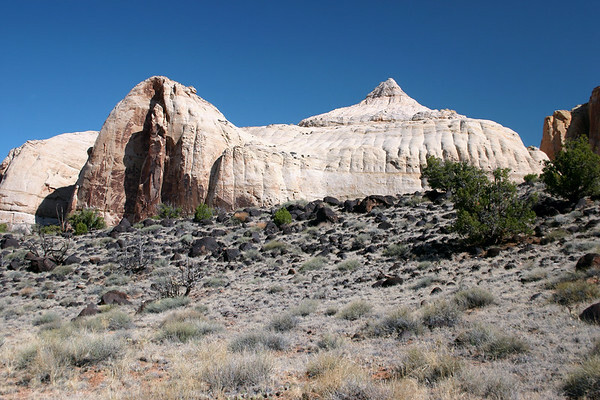 It is divided into three distinct sections: the Grand Staircase, the Kaiparowits Plateau, and the Canyons of the Escalante. 7. Dead Horse Point State Park (1959) - a plateau surrounded by sheer cliffs 2,000 ft. (610 m) high with only a narrow neck of land 90 ft. (27 m) wide connecting the mesa to the main plateau, that overlooks the Colorado River below. 8 Natural Bridges National Monument (1908) - the oldest National Park Service site in Utah - a tree-covered mesa next to deep sandstone canyons, where three natural bridges are formed when meandering streams slowly cut through the sedimentary rock canyon walls. In honor of the Native Americans (Hopi) that made this area their home, the bridges are named Kachina, Owachomo and Sipapu. 9. Goosenecks State Park (1962) - where over a linear distance of 1.5 miles, the San Juan River flows for more than 6 miles through the twists of a 1000 ft. (305m) deep, entrenched river meander.